Loss….. is a video project that has been made primarily with stills. It is a story about the anguish and longing of the people of Kashmir and of the artist who visits the valley. Three stories one of the Muslims, the other of the Pandits and the last one of the artist are bound together by a common thread that reveals the way in which different people cope with loss. In the treatment, it’s an experimental film that shifts from using stills to the video format, from poetry to facts it shuttles between various genres. Even the effects, which are given in some parts, are done in such a way to make it look like an old destroyed film roll. Part 1-During the unrest of 2010 in Kashmir, over a hundred boys were booked under the Public Safety Act & detained without fair trails. Amnesty has called for it’s abolition since it is considered to facilitate the practice of torture. A lot of the boys who are booked are protestors, wanting a free state. But some living in specific localities get caught in the midst of violent situations, without actively participating. This part of the video is a recreation of such a situation. The artist goes to the Valley and meets a young boy who acts as her guide. In the midst of showing her around he gets caught by the authorities for being seen at the protests. While he’s being tortured he has sudden flashes of memories of his childhood and of Kashmiri life. In the end the woman leaves and he dies on the bus stand. This part of the film is inspired by Chris Marker’s La Jetee, a movie made with stills in 1962 that shows a man dying. PART 2- In the1990’s Kashmiri Pandits left their homeland. This was a forceful migration; of what some believe to be, of over a 1,00,000 people. The Pandit exodus made people migrants in their own land. Most of them could never return to Kashmir. But then some did…..In part two the artist interviews Pandits about their experiences of being in Kashmir and why they chose to come back or live there. Part 3- is about the loss that the artist experiences due to which she goes to Kashmir.Loss…..is a 24 minute film about the way the artist views Kashmir over a period of four years. Zikr…. the remembrance was the coming together of various women, who were seeking the presence of the divine. It was a photographic series and a month long festival organised by the photographer at The Attic. It was about women who in their own unique way; connected with God. From a sufi singer, to a Gurdjeiff movements teacher; the pictures where taken while each one was seeking a connect. Zila Khan, who the photographer had shot for the series, opened the show. The show opened at the Apparao Gallery in Chennai in 2008. 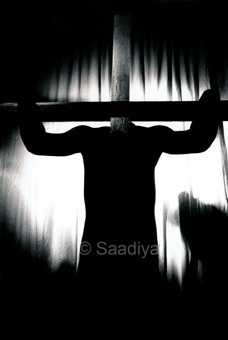 ‘Being…..’ was a series of works that started with Saadiya’s questioning of existence. Contemplating various ideas about suppression, femininity, dealing with the darkness that prevails within and without, for Saadiya; Being…..was about learning how to accept the opposing forces that resided within her. The portrayal of all these feelings was through the human body.